The CribMaster portfolio of software solutions combines real-time data visibility with powerful functionality to give you control over your industrial inventory and asset flow from almost anywhere in your enterprise – reducing costs, increasing productivity and improving safety and compliance. Every CribMaster vending solution connects to the intelligence provided by CribMaster Inventory Management Software. Add mobility, vending and RFID solutions for anytime, anywhere inventory control. Leverage the power of CM Desktop Client and add mobility, vending and RFID solutions for anytime, anywhere inventory control. Operate your tool crib, storeroom, vending and RFID solutions from one software. Connect all sites in your enterprise by scaling the CribMaster Software Suite. Assign employee usage, configure inventory information and adapt the solution as your requirements change. Optimize inventory management for your mobile workforce. Manage your indirect material conveniently from any device, at any time. Stay up to date on inventory status from anywhere. Prioritize site visits based on GPS proximity for efficient routing. Establish permissions to authorize users to gain visibility to their assigned cribs and relevant ordering information. Conveniently check items in and out using a quick mobile-device scan. 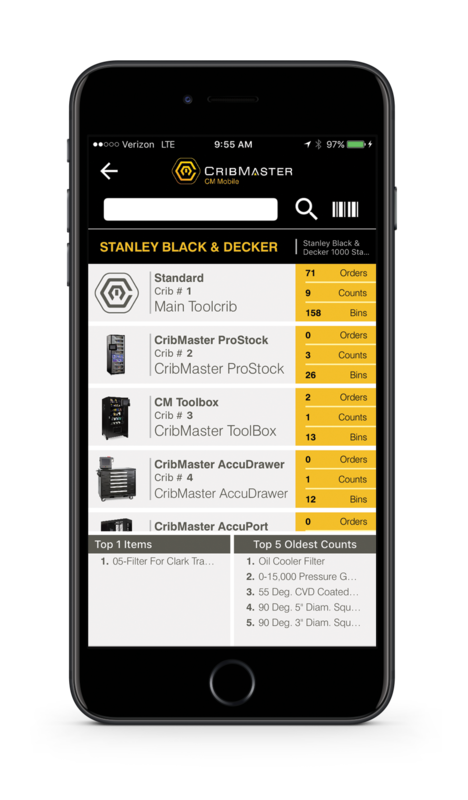 Easily perform counts on your inventory anywhere in your tool crib. Inreal time, the CribMaster Inventory Management System collects all of your indirect material data from every source. For one site or multiple facilities, the software gives you full visibility of—and control over—your inventory flow, all from the same database.Desktop PCs connected to the database through a client-server or web-based services architecture: *RFID scanners and readers, including smartphones, *The software offers flexible configuration options to match your business logic, extensive reporting features, and an innovative methodology that enables it to calculate when and how much stock to automatically reorder. 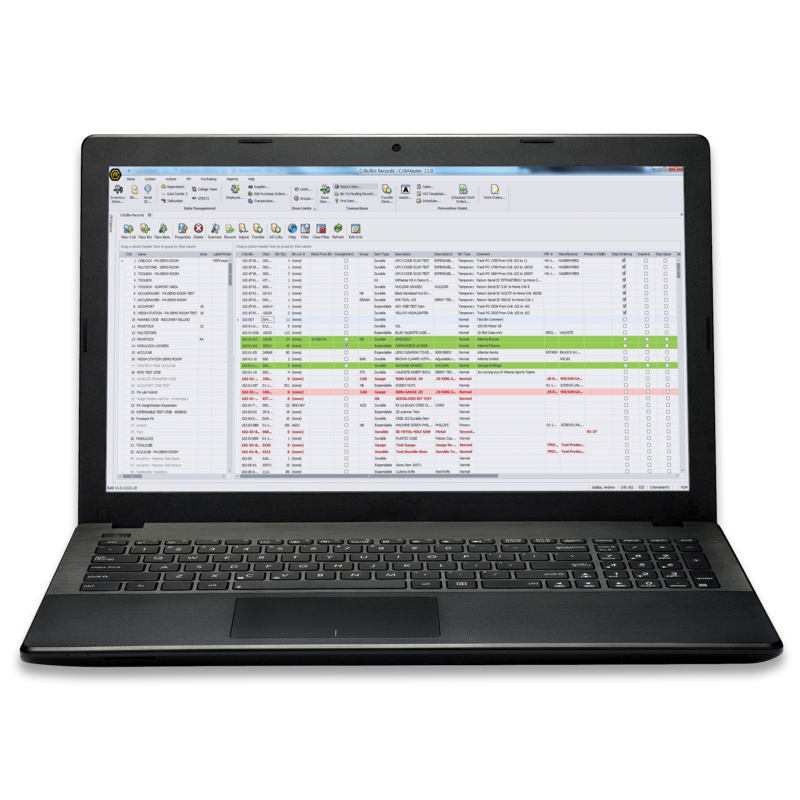 * CribMaster Inventory Management System software comes in standard and Enterprise versions, with powerful capabilities to automate and improve your indirect material inventory processes and FOD conrtrol. The CribMaster Inventory Management System – Enterprise Version is a premium software solution designed for customers to take advantage of the robust capabilities of SQL Server Enterprise edition and Oracle Database. It offers the same applications and device options as the standard version, plus these additional features: Support for up to 10,000 cribs and ATRs, Audit trails to track database changes, Advanced backup management, Security enhancements, Added integration options, Scalability and performance improvements, Enterprise Version gives you the ability to drill deep into every aspect of your organization’s indirect material management using a single database. Wherever you go, the power of CribMaster software travels with you As a CM Desktop Client user, you automatically have access to CM Web. From any web-connected desktop, laptop or tablet, CM Web gives you access to your sites’ databases for maximum productivity while on the go. Optimized for mobility, CM Web provides all of the inventory management capabilities you expect: item issue, return, receive, and counting. During initial setup, the Import Validator checks all employee, crib bin, and user-defined data for rules violations. Administrators can then resolve any issue s detected from right within the application, without wasting time on manual error checking in order to avoid partial imports or multiple reimports. Dashboards CM Web offers both static dashboards and interactive data visualizations to give management a clear picture of inventory health at their fingertips.